SCHOOL BUS SAFETY & LAWS! See school safety tips & school bus passing laws! RALEIGH – The following are highlights from this week at the N.C. Department of Transportation. 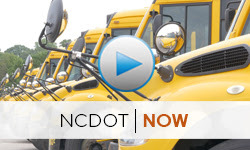 The stories below are also featured inNCDOT Now, the department's weekly newscast. With school starting in many districts next week, it’s important for parents to help their children stay safe at bus stops and for drivers to know the rules of the road. Since 2016, two children have been killed at bus stops. Click on the image above to watch this week's episode, or download a broadcast-quality version. View a list of upcoming public meetings.